Böhm, Wolfgang, Gerald Farin, and Jürgen Kahmann. "A Survey of Curve and Surface Methods in CADG." Computer Aided Geometric Design 1, no. 1 (1984): 1-60. Brown, Jason W. Neuropsychological Foundations of Conscious Experience. [Bruxelles]: Les éditions Chromatika, 2010. ———. Gourmet's Guide to the Mind. [Bruxelles]: Les éditions Chromatika, 2011. Burry, Mark. "Beyond the Algorithm—Seeking Differentiated Structures through Alternatives to Computational Design Processes." In Morpho-Ecologies, edited by Michael Hensel and Achim Menges, London: Architectural Association, 2008. Cache, Bernard. "A Plea for Euclid." ANY: Architecture New York, no. 24 (1998): 54-59. Carpo, Mario. The Alphabet and the Algorithm: Form, Standards, and Authorship in Times of Variable Media. Cambridge, MA: MIT Press, 2011. Deleuze, Gilles. The Fold: Leibniz and the Baroque. Minneapolis: University of Minnesota Press, 1993. Evans, Robin. "Mies Van der Rohe's Paradoxical Symmetries." AA Files 19, no. Spring (1990): 56-68. Gauss, Carl Friedrich. General Investigations of Curved Surfaces of 1827 and 1825. Hewlett, NY: Raven Press, 1965. Gowing, Lawrence. Vermeer. Berkeley, CA: University of California Press, 1997. Hilbert, David. Geometry and Imagination. Edited by Stephan Cohn-Vossen. New York: Chelsea Publishing Company, 1952. Humberto R. Maturana, and Francisco J. Varela. Autopoiesis and Cognition: The Realization of the Living, Boston Studies in the Philosophy of Science. Dordrecht, Holland; Boston: D. Reidel Pub. Co., 1980. Consciousness, edited by Mark C. Taylor, 61-64. London: Wiley-Academy, 2003. Koenderink, Jan J. Solid Shape. Cambridge MA: MIT Press, 1990. 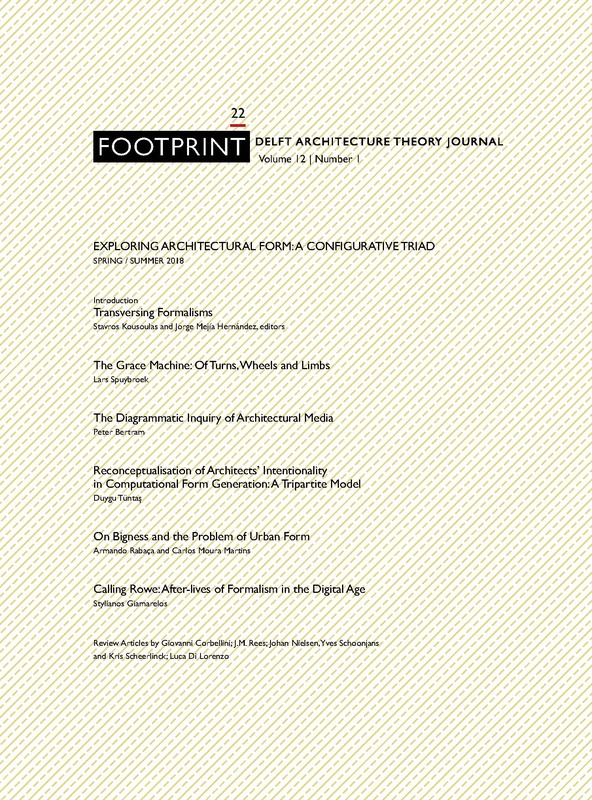 Koenderink, Jan J., S.C. Pont, Andrea J. van Doorn, A.M. Kappers, and J.T. Todd. "The Visual Light Field." Perception 36, no. 11 (2007): 1595-610. Koenderink, Jan J., and Andrea J. van Doorn. "Shape, Shading, Brain and Awareness." In Neuromathematics of Vision, edited by Giovanna Citti and Alessandro Sarti, 87-106. Heidelberg: Springer, 2014. Legendre, George Liaropoulos. ijp: The Book of Surfaces. London: Architectural Association, 2003. Lynn, Greg. Folds, Bodies & Blobs: Collected Essays. Bruxelles: La Lettre volée, 1998. Pesic, Peter. "The Fields of Light." St. John's Review 38 (1988): 1-16. Schumacher, Patrik. "Parametricism and the Autopoiesis of Architecture." Log, no. 21 (2011): 62-79. Todd, James T. "The Visual Perception of 3d Shape." Trends in Cognitive Science 8, no. 3 (2004 c): 115-21. Weiss, Paul. "One Plus One Does Not Equal Two." In The Neurosciences: A Study Program, edited by Gardner C. Quarton, Theodore Melnechuk and Francis Otto Schmitt, 801-21. New York: Rockefeller University Press, 1967. Widdows, Dominic. Geometry and Meaning. Stanford, CA: CSLI Publications, 2004. J.M. Rees directs a design practice based in Kansas City, Missouri. Within the framework of a business established in 1958, Rees designs envelopes, interiors, furniture and surfaces. His approach is analytical, site specific and multidisciplinary. Rees edited and contributed to the books The Sixth Surface: Steven Holl Lights the Nelson-Atkins Museum of Art (2007) and Urban Stories of Place (2006). He has shown in New York and Kansas City. Since 2008 Rees has been collaborating with clients, contractors, architects, engineers and manufactures to develop the next generation of high performance homes tuned to conditions particular to Kansas City. REES, Jack M.. Surform: An Architectural Vocabulary of Morphogenesis. FOOTPRINT, [S.l. ], p. 113-122, apr. 2018. ISSN 1875-1490. Available at: <https://journals.open.tudelft.nl/index.php/footprint/article/view/1751>. Date accessed: 21 apr. 2019. doi: https://doi.org/10.7480/footprint.12.1.1751.